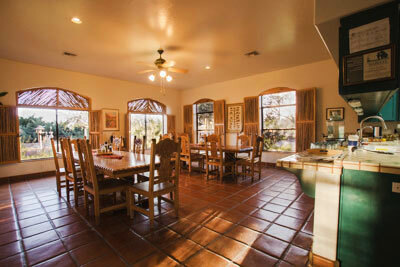 Located 90 miles southeast of Tucson, in the small hamlet of Hereford, Casa de San Pedro Bed & Breakfast (520-366-1300, www.bedandbirds.com) attracts birders from around the world. The reason is simple. Not only is this remote property adjacent to the San Pedro Riparian National Conservation Area, but it’s also located along a major migratory path between Mexico and Canada. But this little piece of paradise isn’t just for bird lovers; in fact, innkeepers Karl Schmitt and Patrick Dome have made it into a cozy, romantic retreat that just about anyone can enjoy. Top that off with some added access features, and you can easily see why this rural resort is the perfect choice for wheelchair-users and slow walkers. 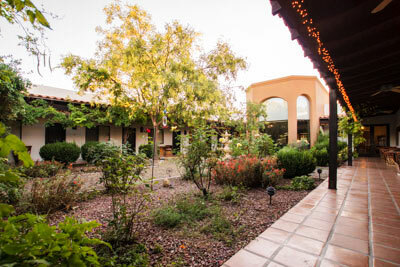 Accessible parking is located near the office of this 11-room property, with barrier-free access to the office and gift shop. From there, you’ll find level access around the courtyard to Room 6, which will work well for most wheelers and slow walkers. Access features include wide doorways, lever handles, a level threshold and wheelchair access between the two 21-inch high double beds. 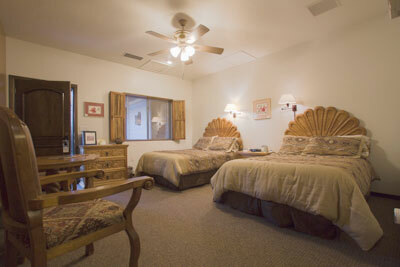 As an added feature, the beds both have electric blankets, which comes in handy on those chilly nights. 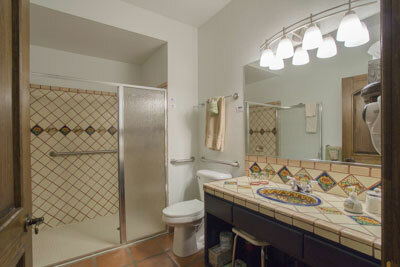 The bathroom has a wide doorway and is equipped with a roll-in shower with grab bars and a hand-held shower head. There is a slight one-inch lip on the shower, but because of the placement of the shower, it’s an easy transfer to the portable shower bench. 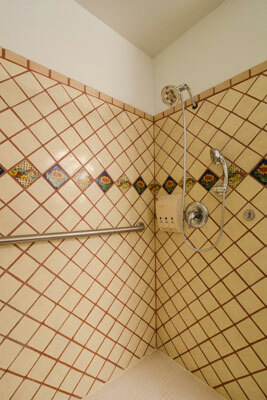 The tiled shower is very spacious and features a lowered shampoo dispenser. 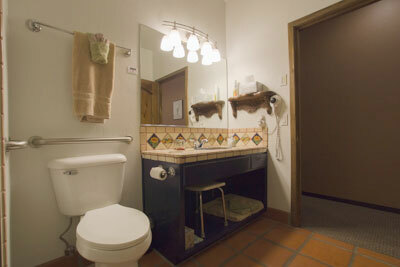 The toilet has grab bars on the right and back walls (as seated), with a shorter than usual grab bar on the right side. And although the sink is not a roll-under sink, it does have some knee space underneath. There is a table with two chairs just outside the room, facing the courtyard fountain.Room 6 is located next door to the great room, which features level access and offers a computer and printer, a fireplace, lots of reading materials and a TV. A scrumptious and filling breakfast is served next door in the dining area, which also features level access. This very pleasant public space also overlooks the courtyard. One of the great features of this property is that it is pretty remote, so with that in mind it’s best to plan ahead for dinner. There is a guest refrigerator and a microwave in a small room near the office, so you can certainly cook there. There is also level access out to an outdoor grill, if you’d prefer to cook alfresco. And don’t worry about packing along dishes, utensils, pots or pans, as there’s a nice selection for guests to use. And you can dine in the dining room or in the courtyard. Don’t worry about dessert though, as Karl and Patrick lay out quite a spread in the dining room every evening. As for birding opportunities, there’s a hard-packed gravel trail to the San Pedro Riparian National Conservation Area next door, which attracts over 335 species of birds. A hard-packed trail runs through the grassland and over to the river, and although it gets a bit bumpy in places, it’s doable for most power wheelchairs and scooters. The great thing about it is, you can go as far as you can manage and then head back. There is also level access a pleasant pond near the B&B BBQ area, which also attracts a fair share of birds. Peak birding season is during the spring and fall migrations, but you’ll certainly find year-round residents there in the off season. In fact, we spotted a covey a Gamble’s quail as we were eating breakfast one morning. You never know what you’ll spot, and to be honest that’s part of the beauty of this nicely accessible property.